This is the first challenge I actually made almost as soon as I read it. Right before putting my place up for sale some friends of mine came over to help me clean out the spare bedroom. They stayed for dinner and I decided to serve them the panna cotta and cookies for dessert. 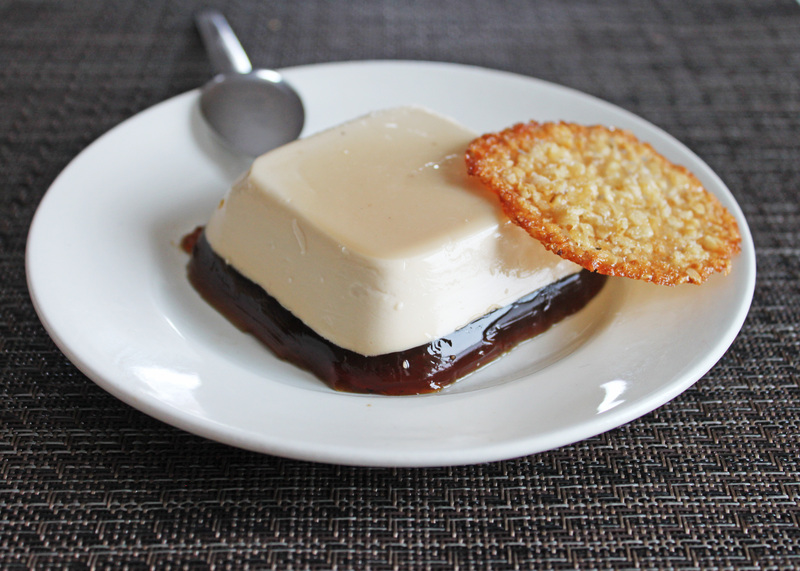 I chose to make Kahlua Panna Cotta with a coffee gelee layer, because I like coffee with my cookies. The panna cotta came together very well, but I had some difficulty with the cookies. With my first batch, I made each cookie too big so it turned into one giant cookie. With the second batch I put fewer cookies on the sheet, but they were still too big. The third batch was the charm. I put about a teaspoon of dough per cookie. I’m not really sure if the cookies were supposed to spread as much as they did, I may have put too much butter in the batter. They tasted really good, but I found them a little greasy. On the other hand, the Kahlua panna cotta with coffee gelee was perfect. The panna cotta was rich and creamy and the coffee gelee was cool and refreshing. I will definitely make it again. In a stainless steel bowl, sprinkle the gelatin over the Kahlua. Place the bowl over simmering water and stir until the gelatin has completely dissolved. In a large sauce pan, combine the cream, milk, sugar and vanilla. Bring to a boil for one minute. Pour the hot cream mixture over the Kahlua and gelatin, stirring until completely combined. Pour the mixture into greased molds or cups. Chill for 3 hours. Once set, pour the coffee gelee mixture into the molds. In a sauce pan, bring 1/4 cup water to boil with the sugar. Stir until the sugar is dissolved then remove from heat. Pour over the set panna cotta. Refrigerate for 2 hours. The panna cottas can be served in the mold, or turned out onto a plate. I love the sound of Kahlua and coffee with these cookies! 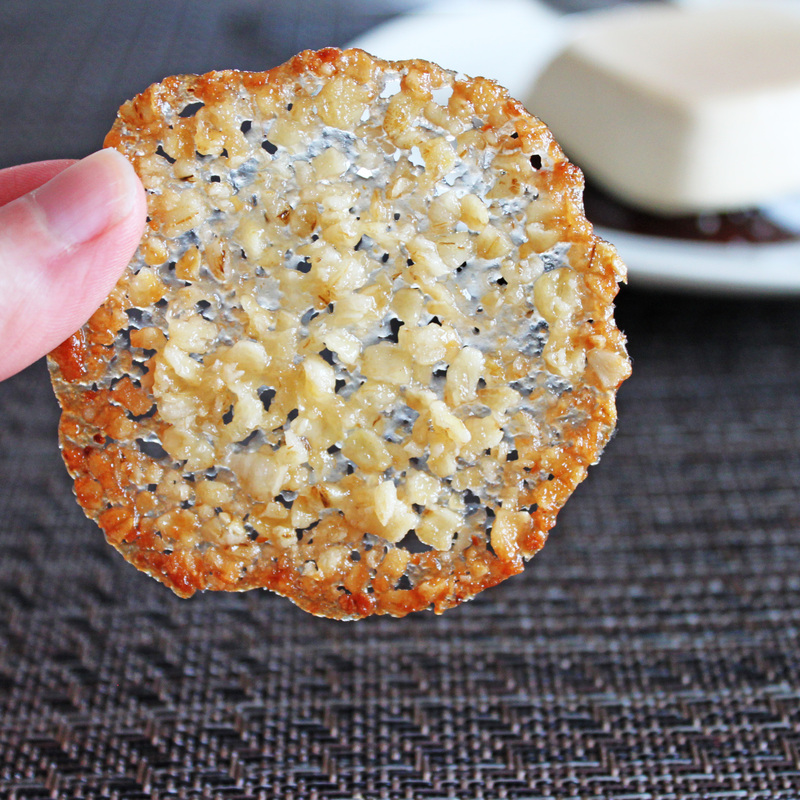 Your cookies came out so thin and lacy – gorgeous! Wow, this looks wonderful. I love coffee so I am sure I would really love this dessert. I like the idea of using Kaluha – YUM! Your molded version is beautiful. What a delicious combination for your panna cotta! I love seeing how creative my fellow bloggers are with the daring baker’s challenges. Great job! I had the same issues with the Florentines and though they tasted good, they were too much trouble. the cookies look so elegant and beautiful! The third batch of cookies turned out really great! My first one spread a lot too and I add some flour, then I think they became more cookies than florentines but they were good. Great job on this challenge! The add of the coffee is genius. It looks wonderful. Beautiful presentation! The panna cotta looks so pretty. I am sure your friends were impressed! I’ve got a bottle of Kahlua that is just begging to be used for this! Looks great! What a great job! I did the chocolate version but will have to try vanilla next time!! I love the coffee layer and i am glad you figured out how to get those florentines to work. It all looks wonderful! And I love the new look of your blog! Your panna cotta looks so perfect! Great looking layers. I had issues with the cookie recipe too, mine were very nearly one big cookie too! Oh, boy, I love the double coffee flavor of your panna cotta, and your Florentines look perfect! It’s one of my favourites- a chic version of Tim Horton’s! I was at Tims today to get myself a roll up the rim coffee and convinced myself not to buy a doughnut because I could make them myself. It’s like you were reading my mind! The panna cotta looks amazing! I’m definitely going to try and make it. Can you provide the recipe for the Florentine cookies too?